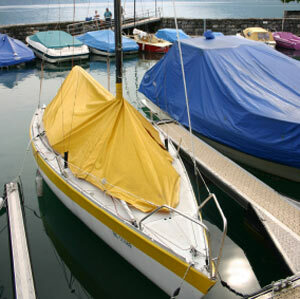 Boat tarp covers range from custom-made covers that fit a boat precisely, to general purpose tarps that use drawstrings, straps, or bungees to fit the tarp snugly to the vessel. A quality canvas or poly tarp cover can protect your investment in recreational vehicles of all types from the damaging effects of sun and water, preserving the finish for years and saving you time and money. The sun will turn paint or gelcoat chalky and cause cracking in the finish over time. Repeated heating and cooling can deteriorate caulking sealant around windows and other fittings, resulting in leaks and potentially very expensive water damage. A tarp cover will help to keep your toys watertight and looking new year after year. Pre-made "instant garages" also offer an affordable way to create a covered parking area for your boat, car truck, or RV. They are available in a variety of sizes for every type of vehicle, from small cars to full-size RVs and even big-rig trucks. Equipment covers for outboard engines, grills, and other outdoor items. There are several ways to go with boat or RV canvas or poly tarp covers. A custom-fit tarp cover — quality Sunbrella canvas with a tight fit, multiple tie-downs, and poles to hold the canvas up and prevent puddles from forming — is probably the best solution, but they can be very expensive. If your recreational budget does not justify such an investment in a canvas cover, there are less expensive alternatives. Any canvas with a good waterproof coating and UV protection will serve the purpose, and while a custom fit is nice, it is not absolutely necessary. Boat or RV covers should be made from fairly heavy canvas fabric, at least 12 oz per square yard, or #6 in the canvas numbering system. There are more generic boat covers or RV tarpaulin covers available from discount canvas suppliers, some of them cut to fit boats of various size ranges. They do not fit perfectly, of course, but with a drawstring around the edge and proper use of tie-downs and home made support struts, they can stay in place and protect your boat without catching and holding rain puddles. Cotton canvas is a good choice for boat or RV covers because it will breathe, inhibiting the formation of mildew underneath. After a period of time, the waterproof coating begins to break down, but the canvas tarp cover can be retreated with specialized sealants such as 303, recommended by the manufacturer for Sunbrella canvas, or you can treat it with an ordinary water sealant such as Thompson's Water Seal. The easiest application method is a chemical resistant hand-pump sprayer. Plastic or polyethylene tarps provide excellent protection as boat covers and RV covers. They have superior waterproofing, but the fabric cannot breathe, and only a good quality one with ultraviolet light protection will stand the test of time. Look for poly tarp covers of at least 4 oz material with UV treatment. White or silver tarps will reflect more light and will not get as hot as darker poly covers. Poly tarps are less expensive than a high-end fabric such as Sunbrella. They also weigh less and take up less room when stored, so there are some good reasons to choose a poly tarp to protect your boat or RV. Canvas or poly tarps are useful as car covers and motorcycle covers to protect your vehicles from the rain and sun when they are not in use. Some car tarps are made to fit specific makes and models, while others come in a choice of size ranges to fit reasonably well on a wide variety of vehicles. Large RV tarp covers are designed to fit RVs and campers. A good canvas tarp cover made with #6 or #8 canvas material and treated with waterproof and UV coatings will last a long time and will prevent the sun from baking upholstered seats, cracking vinyl dashboards, and oxidizing paint or gelcoat finish. The canvas fabric will breathe, reducing excessive heat buildup and the formation of mildew. Polyethylene tarp covers for automobiles or motorcycles will also work well. Poly tarps for that purpose will keep water and sun out, preserving your investment. Custom-made tarps can be used as outboard engine covers, grill covers, tire covers, and for a wide variety of other uses. Cars, boats, motorcyles, ATVs, and RVs are not the only outdoor toys that need protection from the elements when not in use. Barbeque grills, lawn mowers, golf carts, and trailer tires also benefit from tarp covers for protection from sun and rain damage. Tires on trailers and RVs are particularly susceptible to damage from the sun, which causes the rubber to crack because many of them sit for extended periods of time in one place, with the sun hitting the same part of the tire day after day. Canvas or poly tire boots can prevent tires from deteriorating if you do not wish to cover the entire vehicle or trailer with a tarp. Canvas or poly tarps can also be hung on aluminum, steel, or PVC pipe frames to create a portable and inexpensive shade tent. A sunshade tarp can create a welcome spot of shade for relaxation, or a temporary tarp carport to shade your car and keep it cool. A swimming pool tarp cover can help to maintain the proper temperature while preventing the accumulation of leaves and debris in the pool.